What is a good nutrition program? A good nutrition program is part of a whole agronomy package and cannot – or should not – be considered in isolation from soil type, region, the way paddocks are prepared, the crop type and cultivar, crop protection, equipment available, the yield potential and other agroclimatic issues. A good program will look to at least maintain fertility and this goes closely with soil physical and biological health. A nutrition program will aim to supply what is required to meet the productivity expected and balance risk and return. ·	soil test shallow for P and K, deep for N and S.
·	supply a little more N at seeding – use an N-Rich strip to monitor. ·	balance P removal if soil tests were at or near critical values. ·	Take a look at S either at seeding or with early ammonium sulfate applications. The crop is now probably 30-40% into the season and so the nutritional interventions that can be imposed are limited largely to N and S, some K and some micronutrients. It is really too late to do anything about P – the work undertaken over the past few years has shown that while some P can be taken up through the leaves, there is little benefit in terms of grain yield. If you are tissue testing for P there are often low values over winter as the roots grow slowly and so can only acquire small amounts of P. When the season warms, root activity and P uptake will recommence. Zinc in tissues follows a similar trend. Timing relative to growth stage: The earlier N is applied, the larger the yield increase, while the later the N is supplied, the larger the protein increase. Basically, the N supplied will most affect the tissue that is actively growing at that time. Early N stimulates shoots or tillers, while later N can increase stem growth. Once active stem growth slows, later N can be used in grain filling (Table 1). Timing relative to rainfall: Most growers would try to time application of urea ahead of rainfall to that the losses of N as volatilized urea are reduced. The amount of N lost from surface applied urea has been a topic of significant research over the past few years. 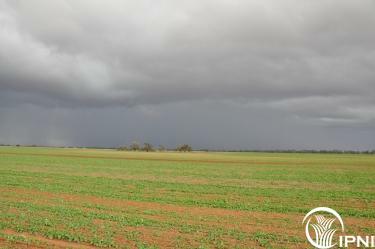 Experiments in cropping systems in the Wimmera and Mallee showed losses of up to 23% from urea, and this loss can halve where there was rain within a day of application (Turner et al. 2012). Soil texture, wind-speed, crop cover, stubble load, soil organic matter and temperature all affect the rate of volatilization. The detail of how much N is lost due to particular rainfall events probably causes more grief than a Collingwood grand final win, but addressing ammonia losses is only one part of the actual efficiency. The poor response of crops to applied N in season is more often a result of the N being stranded in the dry topsoil rather than being all lost through volatilization. Table 1. Responses of wheat (cv Yitpi. 2001, Longerenong) to 20 kg N/ha applied at different crop stages, relative to nil added N.
The key question here is if the crop is actually N limited, and unless this is the case there will be no response and so a low efficiency. Nitrogen budgets are developed from yield estimates (demand) against supply from deeper in the soil or mineralised N will also be important (but often estimated). The rate can be determined based on having adequate N in the crop by anthesis to match the yield and protein target. A 3.5 t/ha grain yield will probably come from a biomass at anthesis of 7 t/ha and to meet a 11% protein target should have around 120 kg N (do the maths up or down). If the post-anthesis conditions are better than the target, then N will be diluted by the extra growth and grain protein decline. If conditions are worse, then grain protein increases. So, the actual yield response will depend on the N rate meeting the gap between the target demand and expected supply (neither of which we know in advance). So there is some luck here in what outcome occurs. N-rich strips offer an opportunity to make in-season N assessments that integrate the prior N supply and demand to assist in determining the degree of N limitation. Having the N isolated from losses due to ammonification, denitrification and leaching mean that – if the crop really needs the N – it can access it with minimal loss. Putting all the N up-front would suggest a good efficiency, but this is when seasonal conditions are least known and so demand is still being formed, the N is exposed to loss processes for longest, and the decision on rate can only be adjust up – not down. It is also important to caution about fertilizer – especially urea – placed in a seed-row. Poor establishment due to damage to germinating seeds can be significant with wide rows, narrow points, light soils and dry conditions (see http://anz.ipni.net/article/ANZ-3076). A 3-5 cm separation between fertilizer and seed is adequate to minimize damage. Inter-row banding pre-crop or even in-crop (side-banding) is an attractive option as it buries the N but the technologies around this require more refinement. There work recent work in NSW and older work in Victoria was encouraging but it is still limited because of its early timing. Newer work with mid-row banding in-crop is very encouraging. However, in most situations, the placement for in-crop application will be over the top of the crop. For dry fertilizers, most will end up on the soil and the fate for urea is to become either ammonia which can be lost, or as plant available ammonium or nitrate. Leaves can absorb inorganic and organic nitrogen sources. Small pores within leaf cuticles can take up urea, ammonium and nitrate. These pores are lined with negatively charged molecules. Therefore, uptake of cations (such as ammonium) is faster than anions (such as nitrate). Uptake of small, uncharged molecules, like urea, is fast. Urea is commonly used for foliar fertilization because of its uncharged, has high solubility and can be rapidly and efficiently absorbed by leaves (Fernandez et al. 2013). For fluid fertilizers, such as urea or urea/ammonium nitrate solutions, depending on the application equipment used, some proportion of the material will intercept the crop canopy and some will hit the soil. Once on the soil, the loss processes are the same for dry fertilizers, but the N on the canopy can be taken up through the leaves. Foliar applied N has been proposed as the most efficient method to present N, and urea is rapidly and effectively taken directly through the leaf surfaces. For highest efficiency, coverage should be good, but crops are susceptible to damage both from urea itself as well as the salt effect of the solution. This urea toxicity will dictate the upper level for effective N uptake, and it is probably around 10-15 kg N/ha depending on crop cover, ambient conditions, and application technology. Streaming nozzles really place fluids on the inter-row rather the canopy, and while reducing canopy damage, they do expose the material to soil surface losses under the canopy. Many of the comparisons of N sources (products) confound the source with both the placement and timing effects, but where N for N comparisons at similar timings are made, differences in recovery of applied N and yield responses are small (Gooding et al. 2007). However, there are quite large differences in cost (Doyle 2013) that need to be balanced against benefits gained. For surface applied N, two experiments showed losses to ammonification as urea (23%), urea/ammonium nitrate (12% and sulfate of ammonia (12%) for 9 days between application and light rainfall on an alkaline vertosol (Turner et al. 2012). In a similar earlier experiment, the loss of N from urea can be reduced from 10% to 1% of applied N through the use of a urease inhibitor (Turner et al. 2010), although the efficiency of this reduction was reduced at higher temperature and higher soil organic C content (Suter et al. 2011). At Birchip in 2013 (McClelland, pers. comm.) showed that N uptake from both UAN (streaming nozzles), urea solution (flat fan nozzles) and dry urea (top-dressed) was similar 10 days after application (DC31). However, by anthesis the UAN (streaming nozzles) and dry urea had more N in the crop than the urea solution. By maturity there were no yield differences, although the UAN and dry urea had higher grain protein contents than the urea solution. Fluid fertilizers offer the opportunity to combine two operations so reducing paddock traffic, as well as giving options for additional nutrients such as S or micronutrients. There are also many other factors at play rather than just selecting an N source to get more N Into the crop, and then achieving a profitable yield response. However, in my opinion there would need to be compelling circumstances where expected losses are high to justify moving away from top-dressed urea, provided as the season unfolds. An important issue with using fluid fertilizer and tank mixing with micro-nutrients and crop protection chemicals is to ensure compatibility – I have included a link to some important information on this in the “For Further Information” section. ·	Soil and environmental conditions can affect tissue concentrations – drought, compaction, frost/cold, overcast, waterlogged, etc. Take care with interpreting low B and Zn values because they in particular can be influenced by these conditions. ·	The right timing according to plant growth stage – as nutrient concentration tends to decline as plants age. ·	Nutrients interact and can give false negatives or positives – so look at the whole nutrient program and not just the tissue value in isolation. In general, tissue tests provide useful information on the nutrient status at a point in time. Best results come fromThe critical values in the literature are largely supported by recent research through the GRDC Micronutrient project led by Dr Wilhelm (DAS00146). Gooding and Davies. 1992. Fertilizer Research, 32, 209-222. Gooding et al. 2007. Field Crops Research, 100, 143-154. Suter et al. 2011. Soil Research, 49, 315-319. Turner et al. 2010. Agriculture, Ecosystems and Environment, 137, 261-266. Turner et al. 2012. Nutrient Cycling in Agroecosystems,93, 113-126.